As of now, its raining cats and dogs in mohali! Might create some problems for ind vs pak. 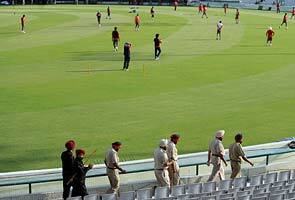 $1>Will the rain Gods play spoil-sport ahead of the India-Pakistan clash at Mohali? With less than 14 hours to go for the high-octane semi-final World Cup match, the host city has been hit by rain. The Meteorological Department has forecast thundershowers for tonight. However, they say the weather should clear up by morning.”It will be comparatively warm tomorrow. The maximum temperature is expected to hover around 30 to 33 degrees Celsius whereas the minimum temperature will be around 17 to 18 degrees Celsius Wednesday,”. Besides the hopes of so many cricket fans, many other things are at stake in this match. All the tickets have been sold out. Apart from Indian fans, around 200 Pakistani cricket lovers are also expected in the stadium.Indian Prime Minister Manmohan Singh and his wife Gursharan Kaur are also coming to witness the match. On the invitation of Manmohan Singh, Pakistani Prime Minister Yousuf Raza Gilani has also confirmed his presence for the marquee game. What if it rains tomorrow?